A Capella group Mixed Company performed early on at the Yule Ball. I entered this year’s much-anticipated Yule Ball with not a small amount of apprehension. So much youth under one roof – all the emotions, the lust, the ill-fitted skirts, the awkward “Is that a wand in your pocket?” moments. I have survived my own “wild and crazy” days and have no burning desire to go back. But, alas, I found myself on an ill-lit dance floor, surrounded by young witches and wizards in various states of motion. There were the shufflers, the shimmiers, but mainly the scavengers – those returning, again and again, from the buffet table, hands and mouths full of chocolate frogs, cockroach clusters, and pumpkin and treacle tarts. I can’t blame the poor things – to eat, after all, is to forget. Or perhaps that is to drink – but the Dark Lord knows there was none of that going on, at least within range of my superior journalistic skills. With my Quick-Quotes Quill, I managed to snag a few thoughts from the some young guests, between their mouthfuls of sweets and each other’s faces. “I bought 50 packs of fake feathers to attach to the super glue that I rolled in,” reported one snowy owl, about to get snowier as damp shreds of something rained from the ceiling in an imitation of a winter flurry. Colorful snowflake images were projected on the far wall, providing something else to look at aside from your date’s wandering eyes or clashing tie and shirt combination. Alex Carpenter performed as the Yule Ball's featured wizard band. The dance floor at times resembled a bar-mitzvah with a klezmer band – Crazy Great Aunt Greta is doing her thing, but the kids know better and stay to the sidelines until they hear salvation in the opening bars of “Starships.” The highlight of the night for me was Azealia Banks’ “212,” whose lyrics I found provocative in a thrilling sort of way. If Azealia herself had made an appearance, I may have put down my quill for a moment and taken a picture with her at the convenient photo station provided for such an urge. If you are reading this, dear, know that I don’t say that sort of thing often. Wandering between costumed dancers I procured a few jewels from their jaded mouths. “It kind of reminds me of a middle school dance, except no one is pushing my head into a toilet,” said one wizard without even rudimentary dance skills. Another party-goer offered a more positive take on the proceedings. 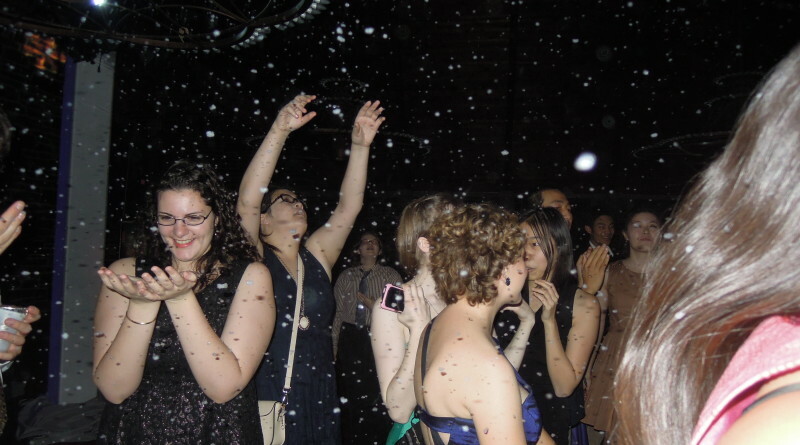 “The Yule Ball is great because it gives me a chance to dance and hang out with my friends who don’t normally go to parties. Finding a properly engaging Wizard Rock performer is still a problem, though I thought Carpenter was easy on the eyes,” he said. You and me both. 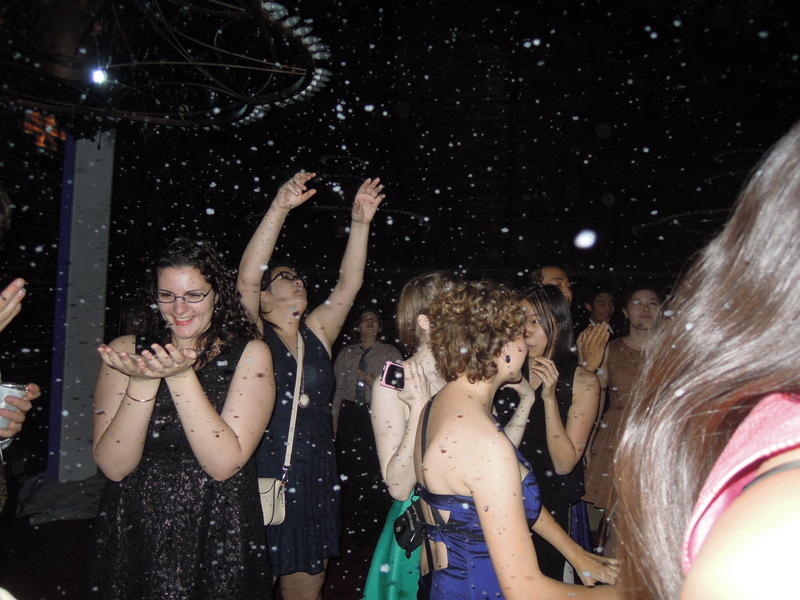 Young witches and wizards applaud the Yule Ball's various vocal talents. “Moustache,” said one mustachioed wizard, pointing to his face and walking away. Another lamented the lack of “grown-up dancing.” Still another assured me that his wand is significantly bigger than Harry’s. “I’ll have to check that fact,” I said. Ollivander, owner of “Ollivander’s Wand Shop” in Diagon Alley, has issued no comment, aside from a small snort when I posed my inquiry. Other young Ball-ers spoke to me about their preparations for the evening’s dancing. Some attended Friday evening’s waltzing tutorial, while others took it upon themselves to educate each other. “My friend was trying to teach me to swing dance before and he punched me in the face,” reported one slightly bruised witch. “Everyone is beautiful – they must have taken potions,” another told me, clearly under the influence herself of a potion of some sort. As a certain eloquent redhead would say, that was bloody brilliant.